Holmes Volume 1 has clocked up its first ten reviews on Amazon. Many thanks to all those who spared the time to provide some feedback. It's very much appreciated. 'Boro & Holmes --- it works! As a friend of author I had the pleasure of not only hearing about his plan to write his 'Boro based Holmes stories, but also to have a sneak preview read of the 1st book too. Always enjoyed Sherlock Holmes stories, and the recent TV adaptations, so I was looking forward to how Holmes and 'Boro would come together in book form. Friend of the author aside, I've thoroughly enjoyed these adaptations and how, as the series moves forward, they've remained both "fresh" to read but stayed true to the Holmes character. Great read and highly recommended! A collection of Short stories that move Sherlock Holmes to Middlesbrough. An intriguing idea which the Author manages to pull off very effectively. 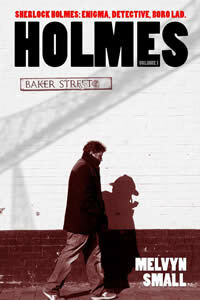 Perhaps purists will not like this new take on Holmes but I really enjoyed the stories and the style of writing. There were also enough nods in the direction of the orginal with character and location names. The author also managed to capture enough of Holmes and Watson's personality to make both the Detective and buddy aspects, so important to the original stories, to shine through. I've known this book was on it's way for some time and was allowed a sneaky peak several weeks ago by the Author - thanks Mel ! It promised to be a good read and indeed it has surpassed my expectations. Mel's easy writing style and gift with words has had me gripped from the start. With enough detail to help the reader visualise without losing the pace of the storyline it's sure to please many more readers. Although they are a collection of short stories the familiar characters throughout keep you wanting more. Well done Mel, can't wait for the next one ! Holmes is alive and well in 'Boro! Having worked with Mel and also being a big Sherlock Holmes fan I was very interested to see how this would work. I really enjoyed the book, it's well written, the characters are good and I enjoyed the hints to some of the original plots. Looking forward to volume 2. Starts from a really premise and then delivers a series of adventures reminiscent of the original stories. I loved all the nods and winks to the original. Looking forward to volume 2. Delightful tales, captures the essence of Teesside folk beautifully blended with the Holmes and Watson traits that have delighted generations of readers and TV viewers. Well put together, short stories; but with a cohesive theme. I was gripped as soon as I started the book and struggled to put it down. Great read, enjoyed it all. Am delighted that Melyvn is working on the sequel, looking forward to it. I worked with Mel for a while and was very interested to see how he could take Sherlock to Middlesbrough and make it work. He did! Once I started reading each story, I had to get to the end of it before I could do anything else, consequently I read the book in just over a day. The stories link together well and have plots that allude to the original ones, along with keeping the bond between Holmes and Watson intact. Looking forward to Volume 2. This was recommended to me and, as I'm also a fan of John Nicholson's Teesside-based books, I was keen to read Mel's take on the Sherlock character. These are short stories - loosely based on real Holmes stories - but with the eminent detective as a Boro lad. The dialogue is typically Teesside and the settings will be familiar to anyone from the area (Baker Street and the micropubs). The wit in the stories will appeal to all readers but especially to those from the area. Always sceptical of a Holmes reboot/ pastiche/ further adventures etc., I didn't have high expectations of this. That said it's well-written, had some good plot lines and I would on the whole recommend it. There were small irritations: lots of lovely clever references for the Holmes fan spoiled by overuse (see the multiple references to the name of the beer they drank) and mixing some very non-Holmsian traits in with things he would absolutely do made for a confused character at times. These irritations are small - and there's plenty to like about this book. I am looking forward to the next one and Mel Small is added to the tiny list of people I trust with Holmes and Watson. That's no mean feat.